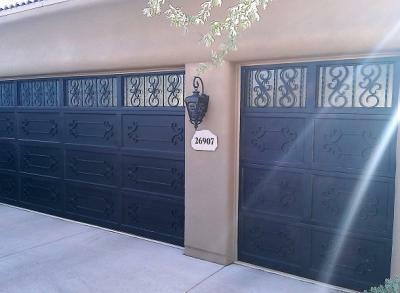 Gilbert is home to countless Signature Iron Door products. No one builds iron garage doors like Signature Iron Doors. These photos were taken recently in Gilbert for some of our Gilbert Arizona customers. 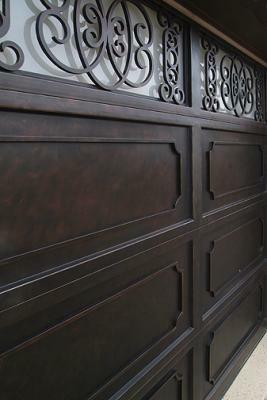 Like all our iron products, our iron garage doors are a statement of class and elegance. Built with 16 gauge steel, they are solid and secure for your and your loved ones. We offer a variety of design options as well as custom designs. Whatever your hopes are for your home, Signature Iron Doors will fulfill them. With a proficient team consisting of licensed welders, iron designers and technicians, a committed sales team, and customer service representatives, our Operations Manager keeps s personal interest in each customer and their products. All our iron garage doors, like these in Gilbert, are fabricated with 16 gauge steel, fully insulated, and finished with a zinc primer and epoxy paint. Although 5lbs/sqft, they are easy to operate with a standard garage door opener. Call us and come by our showroom to discuss further inquiries and find out why Signature Iron Garage Doors are the doors you need.